I wasn't as prompt this year with putting Thanksgiving books on hold at the library, and consequently, they'll all be coming in . . . next week. Sad! I'm pretty sure we'll be happily submerged in Christmas by then and Thanksgiving (at least the holiday, hopefully not the gratitude) will be the farthest things from our minds. However, we did read one new Thanksgiving book that was such a treasure, I think it's worth mentioning today. 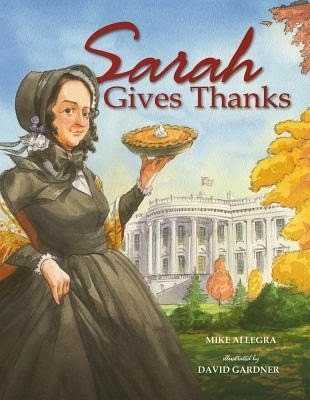 Sarah Gives Thanks is about Sarah Joseph Hale, a real woman who lived in New England in the 1800's. In 1822, her husband, David, died, leaving her to support their five children. 1822 didn't offer a lot of career opportunities for women, but Sarah had the gift of writing. Even before David's death, Sarah had had several of her poems published. So she turned to writing as a way to make a living. She sold short pieces and poems to ladies' magazines and eventually had a book of poetry as well as a novel published. In 1827, she was offered the job of "editress" of a new women's magazine. At that time, Thanksgiving was not a national holiday. It was celebrated in some states (mostly in New England) but not on the same day. Sarah used her influence as an editor to push for Thanksgiving to become a national holiday. In 1849, she started writing an annual letter to the president of the United States asking for his help. She was ignored by four presidents, but finally, in 1863, Abraham Lincoln paid attention and declared Thanksgiving to be a national holiday. Thanksgiving books usually fall into two categories: Pilgrims/American Indians/First Thanksgiving or These Are the Things I'm Thankful For. I had no idea there was such a great Thanksgiving story hidden away in the 1800's. I love true stories. And I love it even more when I can share these true stories with my children in a way they can understand and enjoy. It's crazy to think that without Sarah Hale, I might not be going to my in-laws for Thanksgiving dinner in an hour. There might not be seven pies scattered around my kitchen. I might not have a reason to pause and think about my blessings. What a travesty! It took Sarah thirty-six years of determined effort before her dream was realized. I'm so glad she didn't give up after thirty-five. I love it when I find a story about a strong, opinionated, dedicated woman from our early history. Sarah couldn't vote or hold political positions, but she still could (and did!) make a difference. I'm grateful that women have more opportunities today than they did then, but I'm also so grateful that their lack of opportunities wasn't a reason to hold back women like Sarah Hale. Early in the story, it mentions that since the Pilgrims settled in the northeast, Thanksgiving was mainly considered a New England holiday. I love the statement that follows: "But, to Sarah, Thanksgiving was not about the Pilgrims and the Indians and their famous feast. Thanksgiving was about what that feast meant. The holiday helped Sarah to look beyond her personal problems and appreciate what she had. That message could be of value to everyone, she thought, form North to South and everywhere in between." I am grateful for Thanksgiving. I'm grateful that I can spend a special day remembering and thinking about and being grateful for my blessings. I hope all of you have a wonderful holiday and that knowing about Sarah Hale helps you appreciate the day itself a little more! Oh wow, what a gem of a book! Totally making note of this one! What a beautiful cool choice. I hope you had an amazing holiday doll! Wow! I'm so glad you enjoyed my book! Here's hoping you had a joyous Thanksgiving, Amy! No, thank YOU for writing such a great book about such an amazing woman!